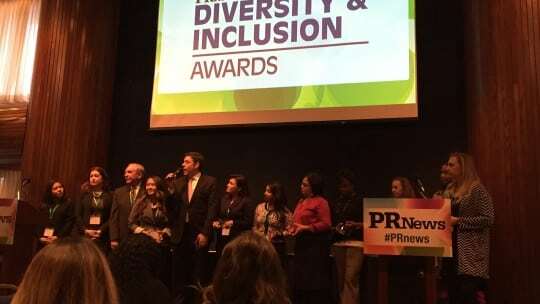 As part of PR News' Winter Awards luncheon, Dec. 6, at the National Press Club in Washington, D.C., organizations and individuals notable for championing diversity in PR came together to be recognized for their efforts. The Diversity & Inclusion Awards highlighted various agencies, brands, nonprofits and individuals who are doing the important work of creating diverse and inclusive workplaces at all levels of the organization. The winners shared some advice about attitudes toward diversity in the workplace and how to make diversity and inclusion a reality throughout an organization. "Knowing your communities, where you live and work...and being able to effectively communicate the value of your corporation's diversity is key to successful campaigns," said Victoria Morales of CITGO. "Our company mission and vision and our core pillars are surrounded and encompassed by diversity programs," said Christina Monaco of Moet Hennessey USA, urging attendees to make inclusion an integral part of their identity. Also honored at the luncheon were the 2016 PR People awardees, 2016 Rising PR Stars 30 & Under and the Top Places to Work in 2016.